Prevent accidents by increasing visibility of hazards with our non-adhesive Barricade Tape. 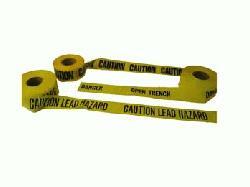 Tape is a lightweight, economical, reusable polyethylene, with a continuous repeat of message or warning. Can be tied, stapled or nailed in place. Meets OSHA 1910.144 for marking physical hazards. Comes standard 3" x 1000'. Also available in 200', 300' and 500' lengths. Other widths available by special order. Comes in a variety of mil thicknesses.